- Reads and clears generic and manufacturer specific diagnostic trouble codes (DTC's) and turns off check engine light. - Wider vehicle coverage with CAN protocol support. - Supports multiple trouble code requests: Generic codes, pending codes and manufacturer specific codes. - Code definitions are displayed on unit screen. - Reviews the emission readiness status of OBDII Monitors. - Determines malfunction indicator lamp (MIL) status. - Retrieves VIN (Vehicle Identification No.) on 2002 and newer vehicles that supports Mode 9. - Reviews the live data on unit screen. - Review live data graph with four items in one screen. - Stand-alone unit with no need for an additional laptop or computer to operate. - Small in size and comfortably fits in the palm of your hand. - Unit updates via internet by USB cable. - Software CD with over 10,000 DTC definitions included. 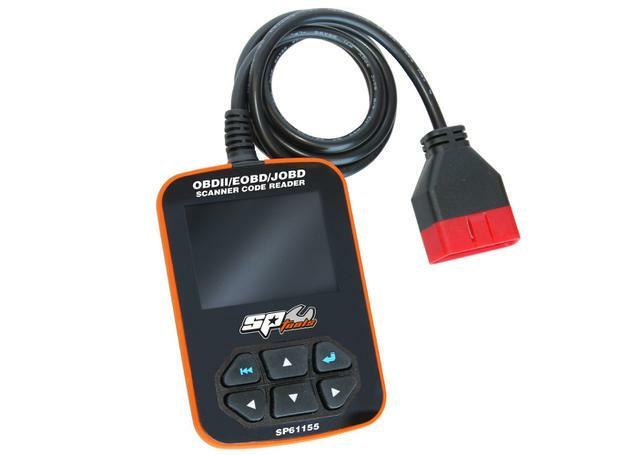 - No batteries needed as the unit is powered via OBD2 cable. - 2.8" TFT color screen displays more information on screen. Ensure your vehicle is on this below list before purchase. As a proudly Australian owned company SP Tools have maintained their position statement of "Manufactured for the Professional". Research, development and innovation continues to drive SP Tools to produce a better product whilst listening to and satisfying the demands of professional tradesman in the global market.